Tonight was one of those nights I had no clue what was gonna be for dinner. I knew I had some things that would taste pretty good together, but the question was how do I execute bringing these flavors together. 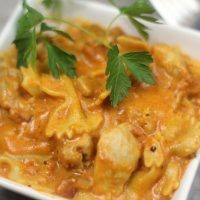 This Easy Cheesy Chicken And Pasta was an amazing one pot wonder, everything came together great with the awesome Instant Pot. I still think to my self, how in the world did I go so long without this magical machine. My Easy Cheesy Chicken And Pasta was literally a one pot meal, there was no cleaning in between, no dumping… Everything in one pot, check out the video. This is definitely one that the kids loved! Then again kids generally love anything having to do with pasta. Make sure you check out the video and when you try this take pics and share in our group Instant Pot Recipes and Talk and Sous Vide.